Remember Anna del Rosario? (If you’ve met her, how could you not?) She ran Altera’s communications programs in the semiconductor (FPGA) space for many years before finding herself in a layoff with a number of colleagues there late last year. She goes from running communications for the No. 2 FPGA company to the No. 3 FPGA company. But she took Altera, in her time there, in a completely new direction and built some really strong media relationships, which, frankly Altera had not always been good at. She now works for a solid company that is a long shot to grow huge and compete in the rarified air that Altera and No. 1 Xilinx do, but she’ll work some magic there, no doubt. For Actel, the FPGA story is about power, and that’s something the Big Two have a tough time communicating well amid big product lines and the battle for performance and logic density. 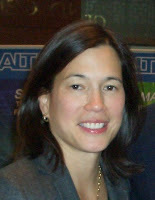 She also gets to work with one of the best CEOs in the semiconductor business, John East. Her new email, for Anna fans, is anna.delrosario@actel.com.